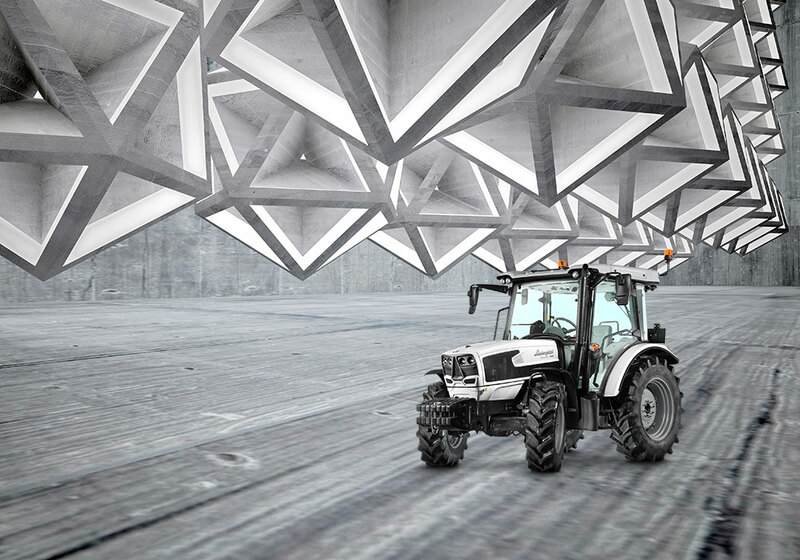 By nature, a Lamborghini tractor has stylish looks that could never be mistaken for anything other than a Lamborghini. But above and beyond its unrivalled elegance, the Spire Trend also boasts state of the art technology conceived for efficiency and reliability, with new 3 cylinder FARMotion engines, a highly efficient transmission, an all-new driver station layout and many other innovative new features. With the sinuous, aggressive forms of the Lamborghini design language, Spire Trend tractors flaunt a stylish elegance that stands apart from the crowd in any situation. The low profile cowl, the design of the air intakes and the intelligent configuration of the lights hint at the painstaking attention to detail that went into the project for the Spire Trend, to accentuate the premium quality typical of the Lamborghini Trattori brand. A modern, compact and efficient engine. The new Spire Trend is powered by the latest generation 3 cylinder FARMotion engine, a powerplant conceived specifically for farming with significantly more compact dimensions and lower noise emissions and fuel consumption than before. The new configuration of the heads and combustion chambers, combined with 2,000 bar Common Rail fuel injection, improve combustion efficiency, maximising engine performance while reducing fuel consumption. A combined exhaust aftertreatment system with electronically controlled EGR exhaust gas recirculation with a cooled external circuit and a maintenance-free DOC catalytic converter allow the Spire Trend to attain compliance with Stage III B emissions control regulations. The right ratio for every job. Spire Trend tractors are offered with a choice of different transmission configurations to cater for any possible need. The base variant consists of a modern 5 speed gearbox with 3 ranges and power shuttle, allowing the tractor to work at just 287 m/h at maximum engine speed in the lowest ratio, and with overdrive for a top speed of 40 km/h at partial throttle. As an option, a splitter (controlled from a lever situated conveniently under the steering wheel) may be added to double the number of forward speeds offered, increasing the number of ratios available from 15+15 to 30+15. For maximum traction and draft in all conditions, electrohydraulically engaged all-wheel drive and differential locks are standard. For maximum productivity with any implement, Spire Trend tractors are equipped as standard with a 50 l/min hydraulic pump and with 4-way (or optional 6-way) mechanically controlled auxiliary distributors. For uncompromised safety and impeccably smooth steering action even at the lowest engine speeds, the steering circuit is fed by a dedicated, separate 18 l/min pump. The mechanically controlled rear lift has a maximum capacity of 2,500 Kg as standard, which may be increased to 3,500 Kg as an option. The PTO comes as standard with 540 rpm and 540 ECO speed modes, while a 1,000 rpm mode or ground speed mode may also be added as an option. A practical lever lets the driver engage the dedicated PTO clutch precisely and progressively. Class beating comfort and ergonomics. The stylish and supremely comfortable new cab of Lamborghini Spire Trend tractors offers extraordinary visibility and features the most user-friendly control layout in its class. The entire driver station has been optimised to offer the operator a rational and ergonomic working environment. The driver seat is equipped with mechanically sprung suspension (or, as an option, air-sprung suspension) adjustable to perfection to suit the weight of the operator. All the controls are right at the driver's fingertips, while the new analogue/digital display moves together with the adjustable rake steering column to ensure that all the main operating parameters of the machine are clearly visible at all times.